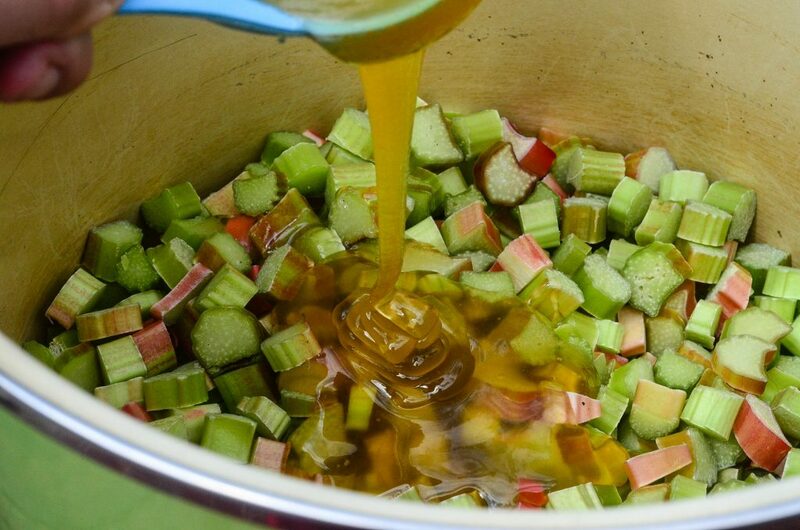 Oh, Rhubarb Chutney, you make my heart sing. Even though I didn’t grow up eating chutneys, I will admit that they’re a nostalgic food for me. Not for the memories of eating them, perhaps, but for the memories I hold watching Hugh Fearnley-Whittingstale cook them on River Cottage. It’s no secret that I’ve got a crush on Hugh, and well, the entire River Cottage staff pretty much. Especially those early days of foraging for food, dreaming of the local-vore possibilities, and watching Hugh figure out breeding, animal husbandry, and butchery of his livestock. Hugh. When I’m rich, I’m coming to live at River Cottage. Take note. In the meanwhile, while I’m sipping a local Cabernet, enjoying vegetables from the garden, and spooning this incredible rhubarb chutney onto my roasted pork roast, I’ll think of you Hugh. And all your incredible chutneys. 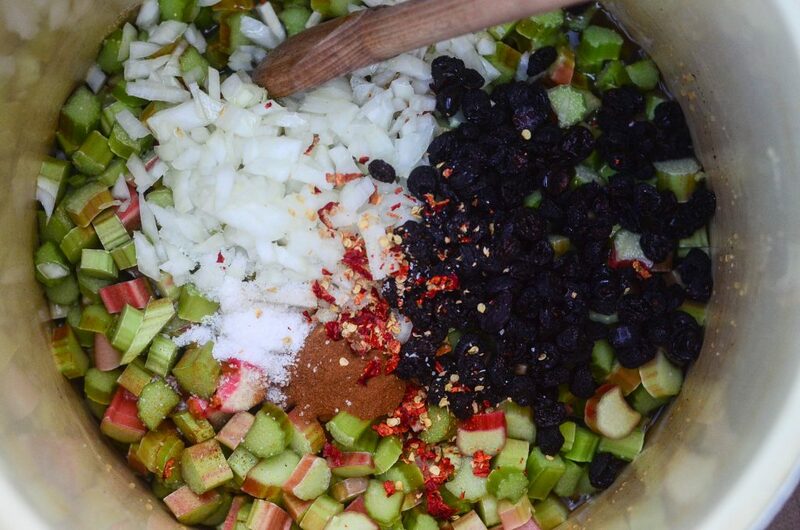 I’ve got rhubarb coming out of my ears so naturally, this is the chutney I chose. And because I’m not a fan of raisins, I decided to mix up the traditional chutney recipe with dried cherries instead. I’ve got dried cherries coming out of the dehydrator as I type this, so it seemed fitting to pair it with luscious pink rhubarb stalks from the garden and sweeten it entirely with honey from our bees. 1. Combine all of the ingredients in a large pot. Slowly bring to a simmer. 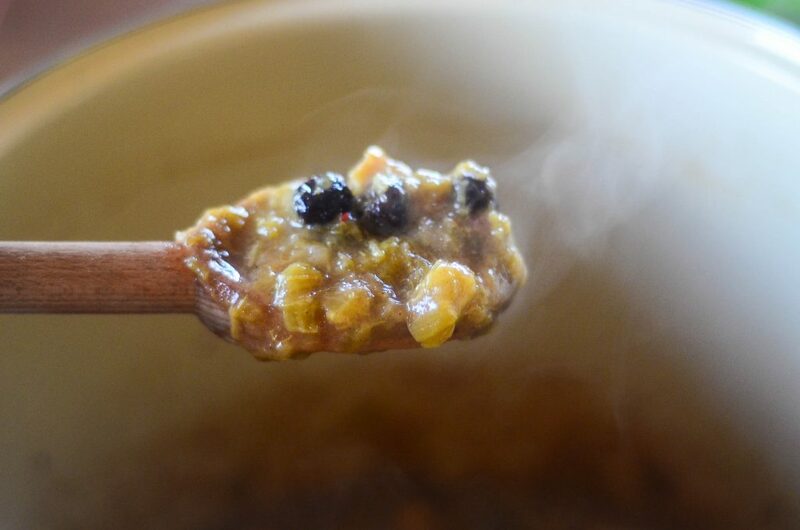 Allow the chutney to gently simmer for 30 minutes, until it cooks down and becomes thick. Stu’s a more chunky-chutney person, so he likes his cooked down less. I’m a less chunky-chutney person, so I like mine cooked down a bit more. To each his own chutney. Unless ‘each’ is making the chutney themselves. Then they get to decide. Muah ha ha ha. 3. Once cooled, transfer the chutney to the refrigerator. Use within 4 week. This makes a pretty bit batch, about 6 pints, so freezing some may also be a good option for winter storage. Half of mine was refrigerated for immediate consumption with our pork from last years hogs. Ah-maz-ing. The other half is stashed in the freezer for a rainy day. 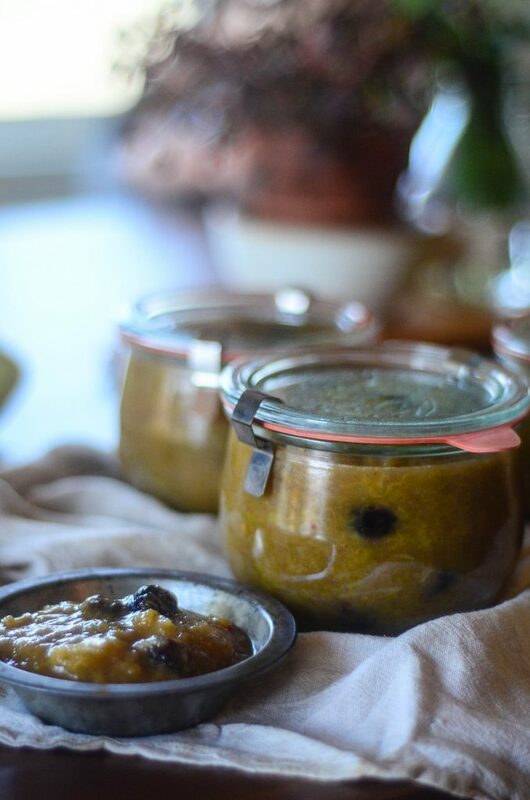 I didn’t want to bother with water canning the chutney because the thought of heating up a giant pot of boiling water was about enough to do me in. Have I mentioned it’s approximately 1,391 degrees here? Well, now I have. 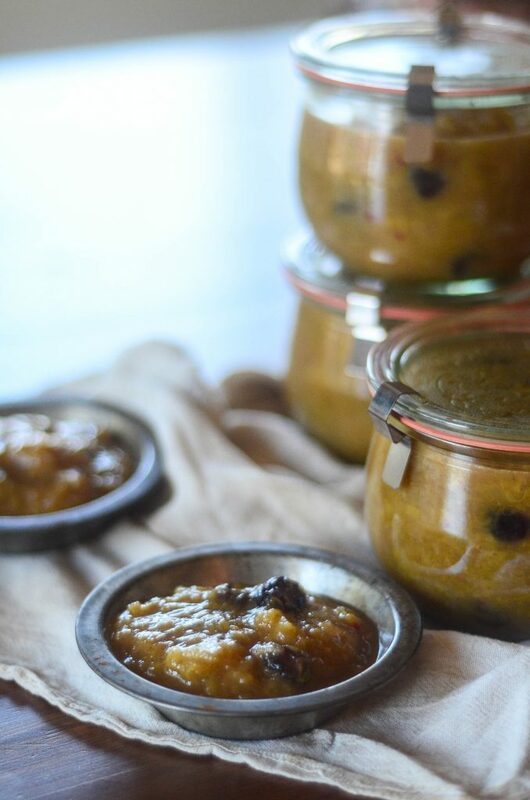 Regardless of how you choose to store your chutney, just know you’re in for a treat. 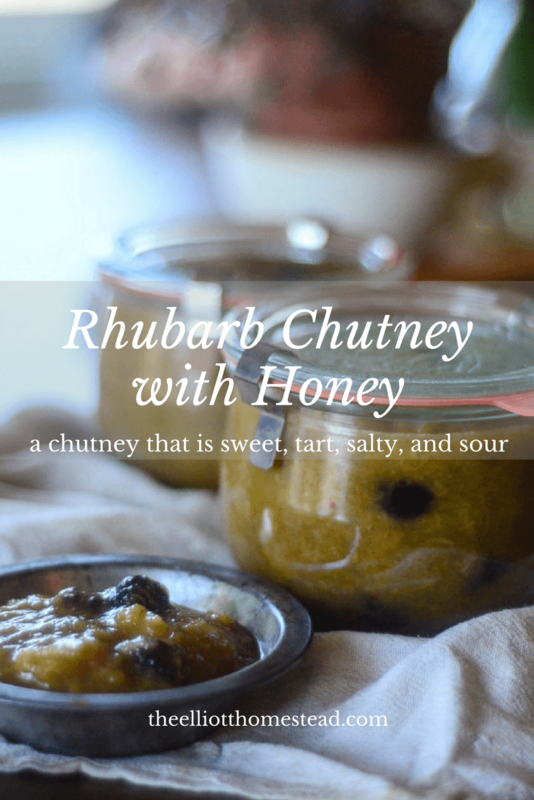 This rhubarb chutney is sweet, tart, salty, and sour. All of the great flavors, man. And pair that with a fatty pork roast? Fu-get-about-it. I agree Hugh. You should invite us. In the meanwhile, I’ll eat chutney and dream of River Cottage and Dorset and all the beautiful places yet to be enjoyed from afar. Combine all of the ingredients in a large pot. Slowly bring to a simmer. Allow the chutney to gently simmer for 30 minutes, until it cooks down and becomes thick. Stu’s a more chunky-chutney person, so he likes his cooked down less. I’m a less chunky-chutney person, so I like mine cooked down a bit more. 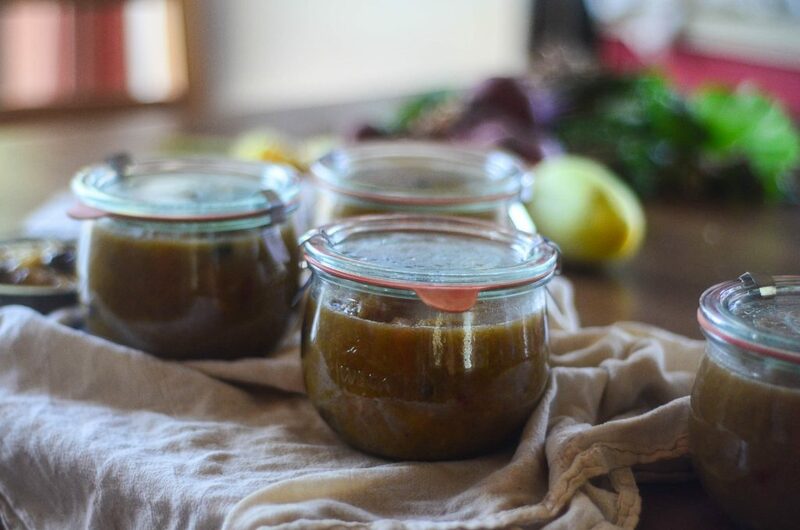 Once the chutney has simmered down, ladle it into canning jars. Once cooled, transfer the chutney to the refrigerator. Use within 4 week. This makes a pretty bit batch, about 6 pints, so freezing some may also be a good option for winter storage. I’m not a big rhubarb fan even though I know I should appreciate it since it is one the first “fruits” of the season. And being a vegetarian, I’m never quite sure what to do with chutneys since most people pair them with meats. Your totally local chutney sounds good though. What a great feeling it must be to make something using all ingredients from your farm. But the Chutney sounds delicious! I must give it a try on my next harvest! I decided to leave my Rhubarb alone this year. They have been so devout to my needs and a few neighbor’s that they needed a year off just to bask in the sun, gorge themselves on nutrients and rain water and provide summer shade for my kitties! Then the Lord blessed me with about 100 lbs. of strawberries! Next year I’ll give this Chutney a try! Looks like it would grace the Thanksgiving or Christmas table!